As stated earlier, Buddhism is the main religion in Bhutan, with over 75% of citizens practicing the faith. On many hillsides in Bhutan, prayer flags are set up to offer prayers to nearby sentient beings, and houses fly small white flags on their roofs to show that the owner of the home has made their offering to the local god. 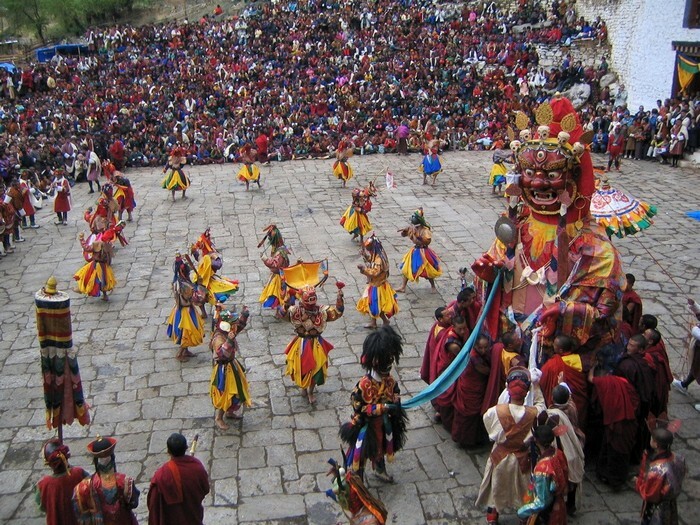 There are many religious festivals called Tsechu, where locals make offerings to the nearest monastery. At every village in Bhutan, there is a dzong, or high-walled fortress that becomes the religious and administrative center of the town. Dzongs are different from monasteries because monasteries are more spread-out and they are not found near villages or towns, and by the fact that monks only serve in monasteries, despite dzongs still being religious buildings. In the monasteries of Bhutan, monks will join at the ages of 6-9 yrs. old. Both genders can be monks, but there are a very limited amount of female monks. 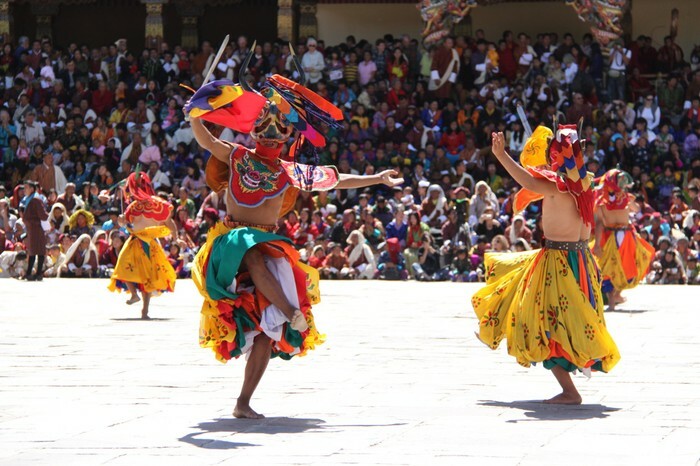 The monks will learn to speak Chhokey, the language of the ancient texts in Bhutan. The monks will eventually have a choice between studying theology and Buddhist theory, or take the option of practicing the rituals and personal practices of Buddhism. Having a monk in the monastery gives good karma for the monk's family. Each monastery is led by an abbot who is typically a lama, or high priest. The highest monk in Bhutan is the chief abbot of Bhutan, whose title is Je Khenpo. Je Khenpo is basically equivalent to the king of Bhutan. The Central Monk Body is an organization of 600 or so monks who take to the most dire religious duties in the country. The Central Monk Body is housed in Thimphu in the summer, and in the winter they go to the Punakha dzong, the most sacred dzong in the country. 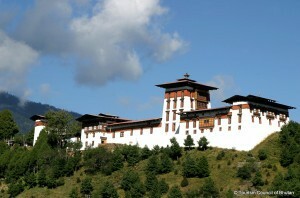 At the Punakha dzong, Shabdrung Ngawang Namgyal's body has been kept since the late 17th century. Shabdrung Ngawang Namgyal was the founder of Bhutan. The Driglam Namzha is Bhutan's official dress and behavior code of the country. It tells citizens how they should dress in public and how they should behave in formal places. Driglam Namzha also sets cultural assets such as art and sets guidelines for Bhutanese architecture. Driglam means in English, "order, discipline, custom, rules, regimen" and Namzha means, "system" so basically it translates to, "The Rules for Disciplined Behavior." The Driglam Namzha was placed on all citizens in 1990. Some citizens who were not of Bhutanese heritage were kicked out of the country because they revolted against the Driglam Namzha, and now many seek long term housing in refugee camps in Nepal. As for the clothing regulations of the Driglam Namzha, men wear heavy knee length robes tied with a belt, called a gho, which folds in a way to form a pocket at the front of the stomach. Women wear colorful blouses over which they fold and clasp a large rectangular cloth called a kira, which makes an ankle-length dress, a toego or short silk jacket can also be worn over the kira. Everyday gho and kira are usually made from cotton or wool, and are simply patterned according to the season. For special occasions, however, silk gho and kira that are opulently decorated can be worn. 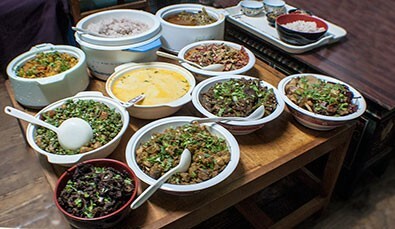 Bhutanese cuisine is very traditional. Some staple foods of the country are: red rice (like brown rice, but with a nutty taste), buckwheat, and corn. An everyday Bhutanese meal might consist of a stew or soup with rice, ferns, lentils dried vegetables, cheese, and chili peppers. In Bhutan, education is a fairly new addition to the country compared to other nations. In 1910, "western" style education was implemented into the country. Until 1910, the only education available to Bhutanese children except for private schools in the cities of Ha and Bumthang was in Buddhist monasteries. In the 1950s, many private schools were built. Some had government support and some were independent. In the 1950s there were 29 government and 30 private primary schools. 2,500 children were enrolled. 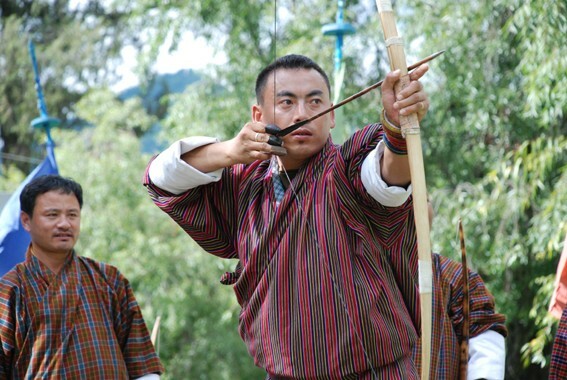 Bhutan's national sport is archery. Archery competitions in Bhutan usually take place in villages all across the country. Bhutanese archery is different from Olympic archery because of the placement of targets and atmosphere of Bhutanese archery. There are two targets placed 100 meters apart and teams shoot from one end of the field to another, and each member of the team shoots two arrows per round. Traditional Bhutanese archery is a social event, with lots of food, drink, and singing and dancing. Competitions are arranged between villages, towns, and some amateur teams. Soccer is the most popular sport in Bhutan, however, but usually the national Bhutanese soccer team is one of the lowest ranked in the world. Cricket is also gaining popularity in Bhutan, due to the introduction of TV channels from India. Darts (or kuru, in Bhutan) is an outdoor team sport where heavy wooden darts with a 10 centimeter pointed nail are thrown at a small target that is 10 to 20 meters away. Not much is known about Bhutan's ancient history. But throughout the 19th century, the country was scattered with civil wars. Also, rulers kept the country closed until the late 20th century. However, Britain, who owned India at the time, was allowed to guide it's international affairs in exchange for an annual subsidy. Furthermore, in 1949 when India became independent, Bhutan closed ties with Britain, but established the same relationship they had with Britain before India became independent with India. Back in 1907, Bhutan was under the Wangchuk Dynasty of monarchs. The third king in that line, Jigme Dorji Wangchuk, made many development projects in the 50s and 60s to modernize the country. He outlawed slavery, and built roads, hospitals, and schools. In 1971, the country ended it's isolation and joined the United Nations. The fourth king, Jigme Singye Wangchuk, who came to power in 1972, furthered the modernization but still wanted to preserve cultural heritage. The country started to require people to follow some Buddhist traditions, and tightened their immigration laws. In 1990, violence broke out as the Nepalese people of Bhutan opposed the Buddhist requirements and were kicked out of the country. Those people, the 100,000 or so of them, have sought out long term refuge in refugee camps in Nepal. The fourth king also moved towards a democracy, and gave up some of his power as a monarch. He stepped down in 2006, and his son, Jigme Khesar Namgyal Wangchuk, became king. Under him, the country became a democracy. The first election for the upper house of parliament was in December 2007, and the elections for the lower house of parliament took place in March 2008. Bhutan Farm to Table Adventure. Digital image. Bhutan Orient. Web. 15 May 2016. Bhutan Travels...with Bow and Arrow. Digital image. Tigersnest. Web. 15 May 2016. Bhutanese family dressed in traditional clothing. Digital image. Bhutan Clothes. Web. 15 May 2016. "Culture of Bhutan." Wikipedia. Wikimedia Foundation, 11 Mar. 2016. Web. 09 May 2016. "Education in Bhutan." Wikipedia. Wikimedia Foundation. Web. 10 May 2016. Jakar Dzong. Digital image. Bhutan Dzongs. Web. 15 May 2016. 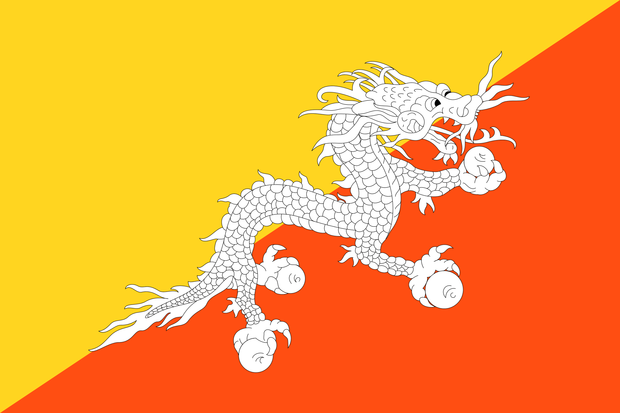 Kingdom of Bhutan. Digital image. Wikipedia. Web. 11 May 2016. "Log in." Britannica School. Web. 10 May 2016. National Assembly of Bhutan. Digital image. Parliament of Bhutan. Web. 15 May 2016. Political Map of Bhutan. Digital image. Ezilon. Web. 11 May 2016. 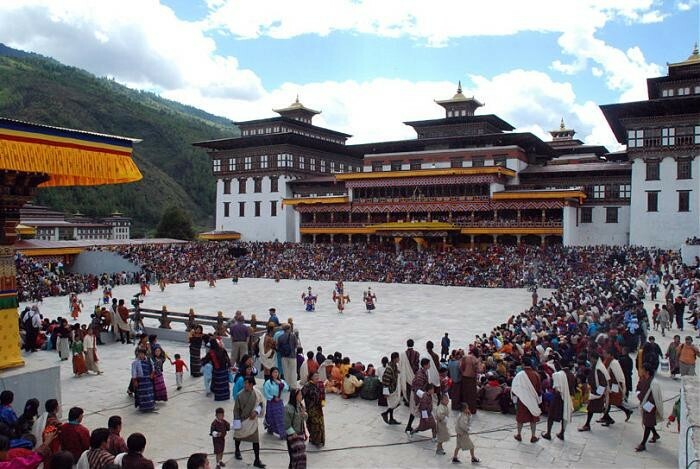 Religious festival in Bhutan. Digital image. Tigersnest. Web. 15 May 2016. "The World Factbook: Bhutan." Central Intelligence Agency. Central Intelligence Agency, 26 Apr. 2016. Web. 06 May 2016.